The National Hockey League is chock full of unique players with compelling stories. The journey that brought Calgary Flames captain Mark Giordano to the big leagues is eye-opening in its own right. But in a league and game that’s increasing skewed towards the 25-and-under talents, Giordano’s push towards being a Norris Trophy contender at the age of 35 at times defies explanation. Typically players start to decline once they hit the age of 30; Giordano has somehow gotten better and battled his way to elite status. A product of the Ontario Hockey League, Giordano found himself making his NHL late in the 2005-06 season rather improbably. Never drafted into junior, he ended up winning a spot on the Owen Sound Attack roster as a try-out player. Not selected in the NHL Draft, Giordano had actually begun to look into college classes when the Flames came calling in the summer of 2004. The Flames infamously lost in seven games in the 2004 Stanley Cup Final, and a huge contributing factor in that loss was a lack of a farm system to provide useful depth players. One month after their Cup loss, the Flames signed a handful of fledgling pros for their shared farm team: Dustin Johner, David Heintz, Carsen Germyn, Richie Regehr, Patrik Nilson, Justin Taylor and Giordano. Giordano was easily the best of that septet, gradually breaking into the NHL picture and spending 48 games there in the final year of his first pro contract. Well-positioned to be a full-time NHLer, he asked then-general manager Darryl Sutter for a one-way contract. Sutter refused, so Giordano bet on himself: he took a one-year deal in the Russian Superleague and signed a one-way NHL deal with the Flames at the end of that season. During his second contract, Giordano kept developing and grew into a reliable two-way defenseman with an underrated offensive touch. He hit double digits in goals for the first time with 11 in 2009-10 and reached the 40 point mark with 43 in 2010-11. When Robyn Regehr was traded at the 2011 NHL Draft, Giordano inherited his alternate captaincy. When Jarome Iginla was traded in 2013, Giordano was named the team’s captain to begin the 2013-14 season. Then his game improbably found another gear. 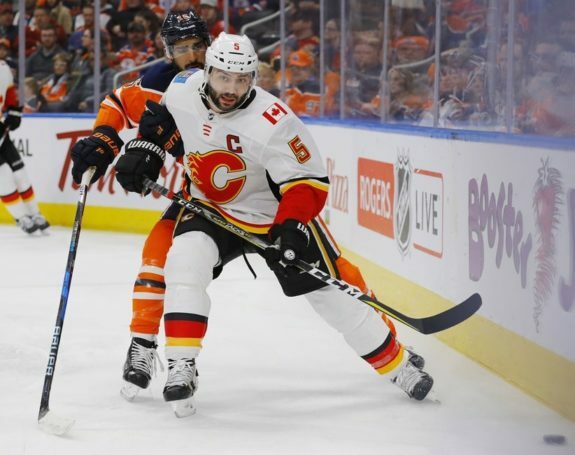 Giordano came captain in a Canadian market at the age of 30 as the Flames beguin their rebuild following the departure of Iginla, beginning the gradual integration of a slew of young players. He was called upon to serve as the face of the franchise and to mentor the team’s up-and-coming players in how to be a professional, as well as responsible for looking after them during key game situations. With more responsibilities on his plate – on and off the ice – than ever before and leading a pretty lean team, Giordano somehow found another gear in his game. In 2013-14, Giordano set a career high in goals and points and finished 10th in Norris Trophy voting – receiving votes for the first time. He set new career bests in goals in 2015-16 and for points in each of 2014-15 and 2015-16. Between 2013-14 and 2017-18, 494 defensemen played games in the NHL – Giordano was 14th among them in scoring, despite playing 24:40 against the very best opposition lines, and being the wrong side of 30. He finished between sixth and 16th in Norris vote in each season. Players aren’t supposed to get better past the age of 30. Most peak in the late 20s and then fall off rather quickly. Giordano plays a physical, up-tempo style of hockey that frequently puts him in the fabric of the game. Despite his age, he’s been a remarkably high-performing, consistent player. Some of that is luck, but credit has to go to his off-ice preparation – he’s finished first or second in training camp fitness testing for several consecutive seasons. Through the first half of the 2018-19 schedule, Giordano is having the best season of his career – at the age of 35. His point-per-game production through 43 games has him among the NHL’s leading-scoring defenders. His strong start to the season, combined with the Flames staking out a spot at the top of the NHL’s standings, has catapulted Giordano to the Norris Trophy contender shortlist. Media utlets ranging from The Hockey News to Sportsnet have touted Giordano’s candidacy. A Flames player has never won the trophy – Al MacInnis didn’t get his Norris until he was with the St. Louis Blues. Only three players have won the Norris aged 35 or older: Nicklas Lidstrom, MacInnis and Doug Harvey. Only seven undrafted players have ever won the Norris, and none since Bobby Orr in 1974-75. Since the modern NHL Draft became the primary pipeline for young hockey talent, the Norris has been the exclusive realm of the drafted players. Giordano has been one of the NHL’s most improbable success stories since he made his NHL debut as an undrafted depth signing, and a potential Norris Trophy win would be a tremendous reward for a workhorse who has become one of the indelible faces of the NHL and one of the most important figures in Flames franchise history. Through half of the 2018-19 campaign, he’s put himself in a strong position to be this season’s Norris winner.